That's me (duh! ): due May 21, my BFF Brittany: due June 26, and Cara: due June 7 (I think, definitely in the first week of June). Not pictured, Mrs. August and September. 5 total between May and September! God is blessing us with growth for sure! 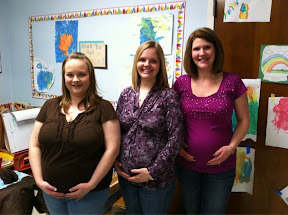 It has been so awesome to share this pregnancy with my sisters in Christ, especially Brittany. She and I always talked about being pregnant with babies #2 together, but it didn't look like it would happen. God decided it would! And PS, yes I have Bieber fever. Don't hate!